So you have depression. Me too for the purpose of this post we will skip through what depression is and the symptoms involved. I thought it might be helpful to look at ways to embrace depression as opposed to fighting it. Fighting can be tiring, sometimes you need a break. I hope this post will apply to other mental health conditions too. I just tend to focus on depression when I write as I can talk from the heart. Depression affects people in its own way, we may all suffer very similar feelings, emotions and symptoms. Ultimately we will deal with them differently. I realised a few years ago that my depression wasn’t going anywhere, that it was sticking around for the time being. That bothered me for a long time. I didn’t want it anymore, I wanted to feel better…. more normal shall we say. A while after processing what those thoughts meant to me, I decided that I was going to change my approach. What the hell is normal anyway? I know plenty people who claim to be normal but as far as I’m concerned, the jury is still out. Rather than fight with my feelings, I decided that I was going to embrace them and make friends with my depression. Now I bet you think I’ve lost the plot if you are still reading but bear with me a moment. You see, why should I beat myself up over something that I can’t control. I didn’t choose to have depression, it has become a part of who I am. You have depression, depression doesn’t have you. Once I had told my close family and friends about my diagnosis, it became easier to talk more open about my mental health in general. On my bad days, I slowly started to forgive myself. I told myself it was ok to be me, instead of fighting the depression, I started to go with the flow of the day. Where previously I would have spent the day trying to correct my thoughts. Arguing with myself over why I felt the way I did. That I was letting my children and husband down, that they deserved so much more than me. Instead I began taking it really slowly, chastising myself a little less. I began focusing on the hour ahead, trying not to spiral into my usual negative mental chatter. Now before we carry on I need you to understand that all these points are just from my own library of thoughts. Things that I have tried and practiced that I have found useful. I am not saying that they will work for everyone or that you will see results over night. It takes time and practice to work alongside your mental health. If we are to break the stigma then I think its good to share ideas that others may benefit from. 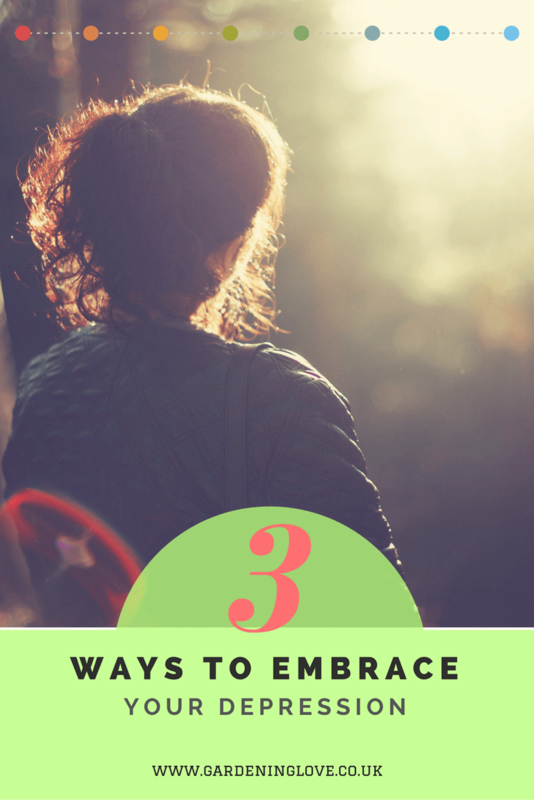 As i continue on my journey these a some of the ways to embrace depression that help me. If you have Seen your GP, followed their expert help and guidance and taken all avenues of support open to you. If you have tried to improve your knowledge of your condition by reading and talking. Have taken proactive steps to improve your mental state, but you haven’t noticed an improvement in your mood then maybe its time to take it easy on yourself. This is what I mean by embracing and becoming friends with your depression. As the saying goes “ keep your friends close and your enemies even closer”. Find ways to work with the depression rather than against it. Listen to your feelings and learn to understand yourself more. Are there triggers ? Are there situations in which you notice a significant drop in your mood ? Can you avoid these situations ? Or if you know that something is coming up which messes with your mental health, then acknowledge that there is a strong chance a depressive episode is on its way and you can better prepare yourself for that. You have depression, depression doesn’t have you ! Get on with your life . Don’t let depression win. You have depression, depression doesn’t have you ! Having mental health issues doesn’t mean that you can’t have a life. Promise yourself that you will make plans, look forward to events and invitations. Yes you will still have your depression, but you will have it whether you choose to sit at home with it or not. Why not take it out for the night instead, give your depression something else to think about. Something might help you take your mind off things whilst your out and if the worst case scenario happens and your just not feeling it then you can always go home, and that’s ok too. Allowing yourself to go with the flow of how your feeling puts you in control. Be open with your friends and family, you may be surprised at how much they will support and understand you, believe me ! If you make plans but then decide you can’t go through with it, at least you made the plans, it’s a start. It’s about learning to take it easy on yourself and not beat yourself up over feeling the need to fit in with everyone else. You can still have a full life with a mental illness, you just have to tweak things a little bit. So if I make plans and the event arrives and it’s a bad day for me, I just don’t go ….it’s as simple as that. Share your knowledge with others. We all need to be there for each other. It’s not a competition over who is having the worst time of it. I started Gardening Love for this reason. Suffering from depression, I know what that means on a day to day basis. I definitely know how scary and daunting it can be to reach out and talk to others. To ask for help. If only 1 person reads my blog and takes something helpful or positive away from it, then it will have served its purpose. Use your depression to help others, its a powerful tool you have. You know the signs and symptoms, you have worn the t-shirt so you have the power to help another. You have to make the most of life. These suggestions wont solve all your problems or cure you BUT, they might help. Anything is worth a try right? How do you cope with your depression? Can you suggest other ways to embrace depression? Please comment and help each other in the comments box below. I completely agree with all your points. Sometimes there isn’t a trigger and it is just one of those days. With any type of illness, people will have worse days than others and hopefully mental health is starting to be talked about more openly. Where people often tell others openly that they are not feeling well, hopefully we will all have the courage to be open about how we are feeling mentally on a particular day. I too, go with the flow on on those days. It’s harder work trying to fight it. For me, sometimes it seems there isn’t a trigger, sometimes I just wake up in a low mood and ask myself why, then I get mad with myself for being in that mood. I just go with the flow on those days. I don’t try to fight it anymore and I find it less exhausting too. I also find listening to an audiobook sometimes helps. Headphones on, eyes closed and just lose yourself into it.